The archives of The Atlantic Philanthropies, among the world’s largest and most influential foundations, will be housed permanently at Cornell. The archives, which will serve as an important resource for philanthropists and historians, document roughly $8 billion in Atlantic grants over three decades – support that has transformed institutions, championed social causes and action, and set entire geographic regions on new trajectories. Atlantic’s records will become part of Cornell University Library’s Division of Rare and Manuscript Collections (RMC). A $4 million grant from the foundation – one of the largest gifts to the library in its history – will pay for cataloging, digitization and outreach for the massive collection, which measures around 2,000 cubic feet in its physical content alone. Through its founder, Chuck Feeney ’56, The Atlantic Philanthropies has been a major benefactor of Cornell. Its donations to the university – totaling nearly $1 billion – include $350 million in 2011 toward the creation of the Cornell Tech campus in New York City, the largest single donation in Cornell’s history. Atlantic’s archive will be a critical tool for philanthropists and organizations seeking to assess and evaluate their giving, said Anne Sauer, director of RMC. After graduating from the School of Hotel Administration, Feeney built his company, Duty Free Shoppers, into the world’s largest seller of luxury goods. In 1984, he created The Atlantic Philanthropies, and quietly transferred his stake in his company – estimated at more than half a billion dollars at the time – to the new foundation. Today, Feeney is considered one of the world’s foremost philanthropists, known for the entrepreneurial nature of his giving and the dramatic changes it has brought about within education, health care and human rights in Ireland, Northern Ireland, Vietnam, Australia, South Africa, Bermuda, Cuba and the United States. Feeney is a strong proponent of “Giving While Living,” and has inspired fellow philanthropists including Bill Gates and Warren Buffett, who have called him their hero and the “spiritual leader” of their Giving Pledge movement, which encourages donors of significant means to give away the bulk of their wealth to significant causes during their lifetimes. The Atlantic Philanthropies’ connections to Cornell run deep. Its gifts to the university, initially made anonymously, led to the creation of hundreds of scholarships and professorships and helped to pay for the re-creation of North and West Campuses, among other efforts. Cornell President Emeritus Frank H.T. Rhodes served on the Atlantic’s board from 1995 to 2000 and chaired it from 2000 to 2008. In 2002, Atlantic’s board decided to end its grant-making by 2016 and close its doors by 2020. As those dates come closer, its leaders chose Cornell as steward of its archives and a place where The Atlantic Philanthropies’ values and mission can continue to influence others. The gift from Atlantic will support the hiring of an archivist, as well as two assistants who will help to organize the material and make it accessible. The archivist will work closely with the foundation over the coming months to ensure that its vision, experience and ethos remain an integral part of the collection, Sauer said. 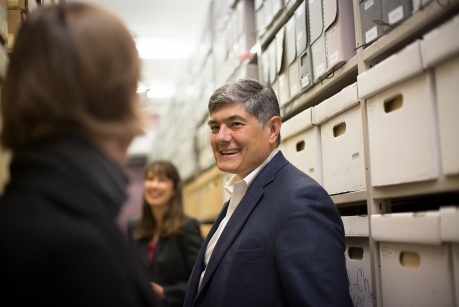 The archivist also will be able to help document and preserve the process as the foundation strategically winds down within the lifetime of its founding donor – the largest organization of its kind to do so.